We’d love your help. 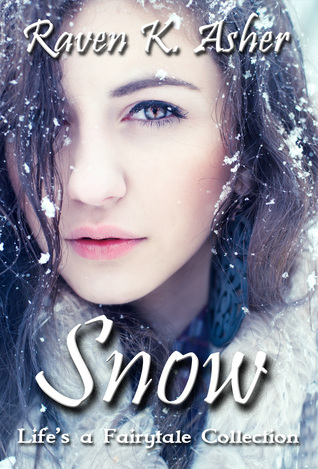 Let us know what’s wrong with this preview of Snow by Raven K. Asher. Published July 10th 2017 by Amazon Digital Services, Inc. The writing in this novel was descriptive enough and good enough that by chapter two I had a tear in my eyes. The words were evocative that already I was drawn in to the story. One problem that comes to notice is, however, is the editing, which is poor. Mostly these are Beta issues and typos, for instance a her for Avery instead of a him. It's a good tale, although some areas feel rushed and simplistic, and not everything pans out with enough information which could have benefited with more deta The writing in this novel was descriptive enough and good enough that by chapter two I had a tear in my eyes. The words were evocative that already I was drawn in to the story. One problem that comes to notice is, however, is the editing, which is poor. Mostly these are Beta issues and typos, for instance a her for Avery instead of a him. It's a good tale, although some areas feel rushed and simplistic, and not everything pans out with enough information which could have benefited with more detail and depth a greater level of complexity. The characterizations are decent which also could have had more depth, especially considering there are a lot of characters which were easy to mix up. All up this is a good young adult read. Isabelle, or Izzy, is in a home for orphans and is saying goodbye to her best friend and big brother, Avery. A couple has come to take him into foster care but not her. After he goes, the lady who runs the orphanage is very mean to Izzy. Then one day a couple comes to take her into foster care. At their place she finds Avery along with seven other boys, her new brothers. Then at dinner the truth comes out that at her last home the foster brother took advantage of her and left her pregnant. Then Isabelle, or Izzy, is in a home for orphans and is saying goodbye to her best friend and big brother, Avery. A couple has come to take him into foster care but not her. After he goes, the lady who runs the orphanage is very mean to Izzy. Then one day a couple comes to take her into foster care. At their place she finds Avery along with seven other boys, her new brothers. Then at dinner the truth comes out that at her last home the foster brother took advantage of her and left her pregnant. Then she miscarries. As time goes by she becomes accustomed to the new brothers and having Avery with her. She takes a liking to one boy, half of a twin, although with a bad reputation. Then the former foster brother shows up with a gun to take Izzy away. Things go very badly from this point on that she;s taken back by the wicked woman. This woman treats her so bad that Izzy comes to the brink of death. OH WOW!! This is a fantastic story and a fantastic retelling of Snow White. You;ll be instantly captivated and your attention riveted to the last page. I thank the author, the Booksprout site and the CreateSpace Independent Publishing Platform editions for this partnership. We find Izzy who has no more family who finds himself in a kind of orphanage. His only friend Avery who is like his brother until the day a family comes to pick him up. Izzy will be adopted by the family who will adopt Avery, she will end up with seven brothers. She will try to be happy. I liked this book less than others. But the character of Izzy is endearing and the story I thank the author, the Booksprout site and the CreateSpace Independent Publishing Platform editions for this partnership. This storyline had me hooked from the beginning. I Highly Recommend this OVER 18 DUE TO CONTENT. This is a MUST READ. It is a real Tear Jerker that takes you on an emotional roller coaster. I loved reading this book I really felt for the kids who have experienced so much in a place they are suppose to be safe and protected. Avery and Isabelle have a friendship that no one can understand until they hear their story. They know all about being in the system and waiting for someone to adopt them and This storyline had me hooked from the beginning. I Highly Recommend this OVER 18 DUE TO CONTENT. This is a MUST READ. It is a real Tear Jerker that takes you on an emotional roller coaster. I loved reading this book I really felt for the kids who have experienced so much in a place they are suppose to be safe and protected. Avery and Isabelle have a friendship that no one can understand until they hear their story. They know all about being in the system and waiting for someone to adopt them and going from foster home to foster home. Only to end back up in a group home together. Another interesting twist to a famous fairytale. Really loved this book and loved the Brother Bear and Sister Bear characters (Avery & Izzy), along with all the brothers who portrayed the seven dwarfs. The author did a great job portraying all the characters, making you fall in love with each and every one. The book was heartwarming and heart wrenching all at the same time. I can't wait for the next one. This is my first time reading this author and I will be reading more. She had you captivated from the very beginning and you don’t want to put it down. The only issue I had was trying to read between my tears. The story was so raw, touching and beautiful in so many ways. The story gives you a glimpse of the foster care system and the strength the children have to survive some of the situations given to them. As the story goes on you realize that family and best friends are everything. But can the This is my first time reading this author and I will be reading more. She had you captivated from the very beginning and you don’t want to put it down. The only issue I had was trying to read between my tears. The story was so raw, touching and beautiful in so many ways. The story gives you a glimpse of the foster care system and the strength the children have to survive some of the situations given to them. As the story goes on you realize that family and best friends are everything. But can they erase all the negative that has happen in her earlier life. What will her future be like. This is the 1st book I’ve read written by Raven K. Asher; she has done an excellent job at writing a good book. I can’t wait to read more of her books. Beautiful story with amazing characters. I loved everything about this story. It had the usual teenage angst but it also had so much more. I hope there will be more stories in the future with some if the other characters from this book, especially Avery. The author created some very memorable characters with her descriptive writing who are likable and interesting all on their own. Great book. This is the first book I've read by this author and I enjoyed it a lot. I liked the storyline and the characters. I loved the bond between Avery and Isabelle and all her foster family. I loved the chemistry between Izzy and Lynx. Would love to read more about Izzy and Lynx. Highly recommend. The book is a good teen and young adult romance read. The characters are good. The story gives the reader a glimpse in to the foster care system, and the strength that the children have to survive some of the situations they are in. This is a sweet little romantic tale about an orphan who finds a family and true love. I enjoyed the book very much. Wow this was such a great twist of Snow White. The heartache I felt for Izzy and the pain that she went through. In the end she ended up with more love than she could ever imagine. I so loved reading this story it has strong characters and a wonderful story line. I can not wait to see what one of my favorite authors will write next. The book has a good storyline that is captivating. The characters are intriguing, engaging and well developed. I did like reading this book. This is YA but mature omg I loved this story it told of a young girl in foster care finally getting her dream family but she had to go through a lot! Also Izzy has a lot of trust issues so when a boy comes In her life will she let him in as well as her new foster family? Well done Raven. I look forward to more!